Magician gave Aidan O'Brien his ninth victory in the Tattersalls Irish 2,000 Guineas at the Curragh. Sent off at 100-30 and ridden by the trainer's son, Joseph, the colt followed a strong pace set firstly by Ask Dad, and then by the Jim Bolger representative Trading Leather, who still looked in control with a couple of furlongs remaining. O'Brien junior never panicked and Magician powered clear to end up a convincing winner, with Gale Force Ten completing a Ballydoyle one-two. 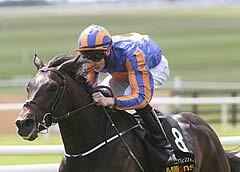 O'Brien junior, winning his third Irish 2,000 Guineas, said: "He's a very, very tough horse and tries very hard. He stays well, he handles fast ground, he relaxes. He's a horse that is improving every day. "We went a nice gallop, I was always very happy throughout the whole race. I was able to dictate things my own way. "After passing the three (furlong marker) I was very, very happy. I thought it would take a really, really good one to come and get me. He galloped all the way to the line. He has loads of pace. I think the key to him is fast ground. "He settles very well and he has a great attitude - I couldn't say he wouldn't get further than 10 furlongs, either." Coolmore supremo John Magnier told At The Races: "He did it well you have to say, he was impressive. This is an improving horse and being by Galileo he should stay further. "We'll discuss it (plans), but all there are all kinds of options. We could go the St James's Palace Stakes route, and we've done crazy things before - we could run him at Epsom or go for the Eclipse. I'm saying that (Epsom) tongue in cheek, but we could. We'll savour the moment and not get carried away."